Overview of the study methods. 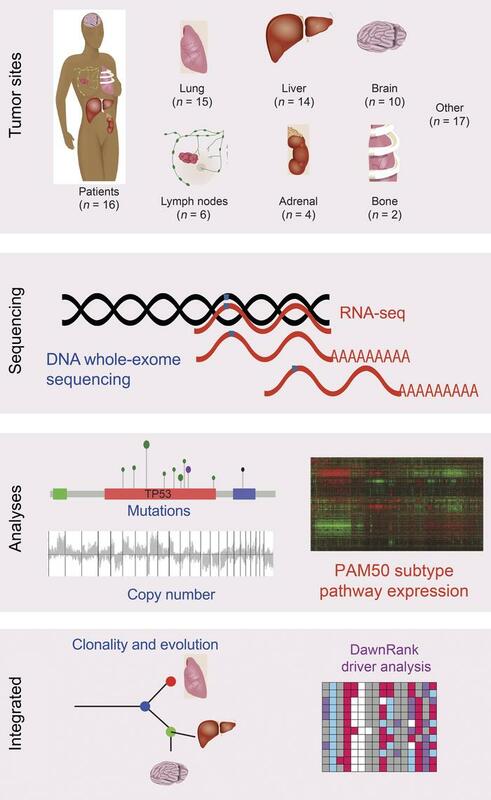 Primary tumors and 68 metastases from 16 patients who died of metastatic breast cancer were sequenced with both DNA whole-exome sequencing and RNA sequencing. DNA somatic mutations, somatic copy number alterations, and RNA gene expression were called. Biologic subtype was determined with the PAM50 predictor. Clonality was determined from the DNA mutations. Genetic drivers were predicted using the DawnRank driver analysis tool, integrating RNA expression, DNA mutations, and copy number.